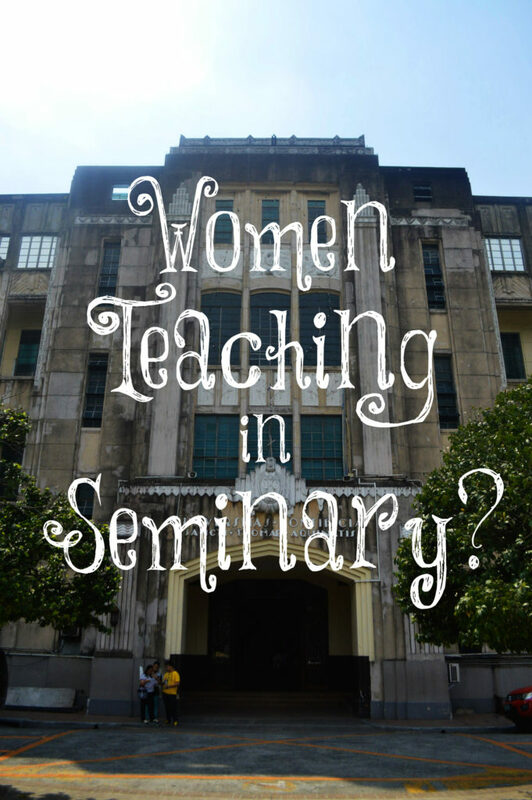 A few days ago, I read an article by John Piper called Is There a Place for Female Professors at Seminary? My immediate response when I saw the title was NO! If women are to be silent in the churches and not to teach nor be in authority over men, they should NOT be teaching men in seminary who are preparing to be pastors and teachers of the Word. John Piper wrote: “If it is unbiblical to have women as pastors, how can it be biblical to have women who function in formal teaching and mentoring capacities to train and fit pastors for the very calling from which the mentors themselves are excluded? I don’t think that works. The issue is always that inconsistency. If you strive to carve up teaching in such a way that it’s suitable for women, it ceases to be suitable as seminary teaching.” I agreed with him 100%. Yes, women, Melissa’s tweet is in direct disobedience to God’s clearly stated Word and instead, wanting to be in control just like Eve. 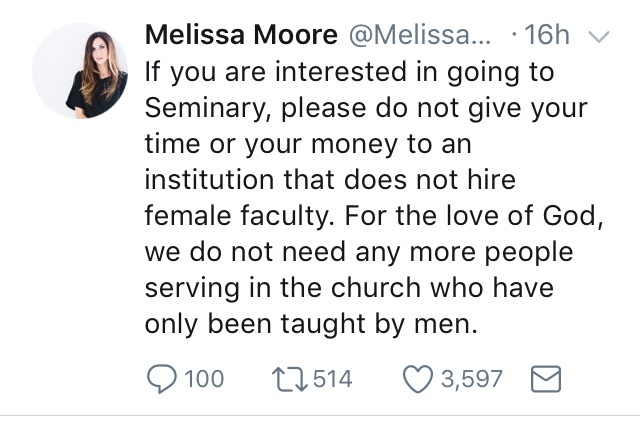 I’m not even sure women should be attending seminary. They can easily learn the Word from reading their Bibles, listening to capable men of God who have gone to seminary, and asking their husbands at home as the Bible instructs. There’s absolutely nothing wrong with being only “taught by men” since every single book of the Bible was written by men, and elders (those who are called to teach the Word) are to be the “husband of one wife.” Jesus was a man! Would she have trouble only learning from Him? The Apostle Paul wrote to Timothy, “And the things that thou hast heard of me among many witnesses, the same commit thou to faithful men, who shall be able to teach others also (2 Timothy 2:2).” He could have easily added in there to “commit thou to faithful men and women” but he did not. The preaching and teaching of the Word of God was given to men. “Jesus wants us to be faithful to our calling and humbly acknowledge that we are just doing what we are supposed to do. Herein is the problem that plagues the typical evangelical woman. She doesn’t know what her calling is, she is subsequently discouraged, and lives an unfulfilling life. “To address this problem we have the never ending series of ‘women’s ministries’. Women flock to these ‘ministries’ in the hopes of gaining some sort of ‘breakthrough’. They are taught their purpose can be realized by either starting their own ‘women’s ministry’ or working within one already established. As I have stated before, if God doesn’t want women teaching men because a) man was created first, therefore, the one that God placed in authority, and b) the woman was deceived, as perfect Eve was deceived by the serpent, why would He want women teaching other women more than what He has specifically called them to teach in Titus 2:3-5? Most of these female preachers/teachers of the word fail to teach any parts of Titus 2:3-5 since these things aren’t popular to teach and, most likely, these women are not keepers at home. But this is what God has “called” the older women to teach and He has never called the young women to be involved in “women’s ministries” or teach the Word to others. I agree with Pastor Robert Truelove 100%. Yes, I may be in the minority but it’s what I see clearly from the Word of God. “A Christian woman should be taught to find her calling first and foremost IN HER HOME. 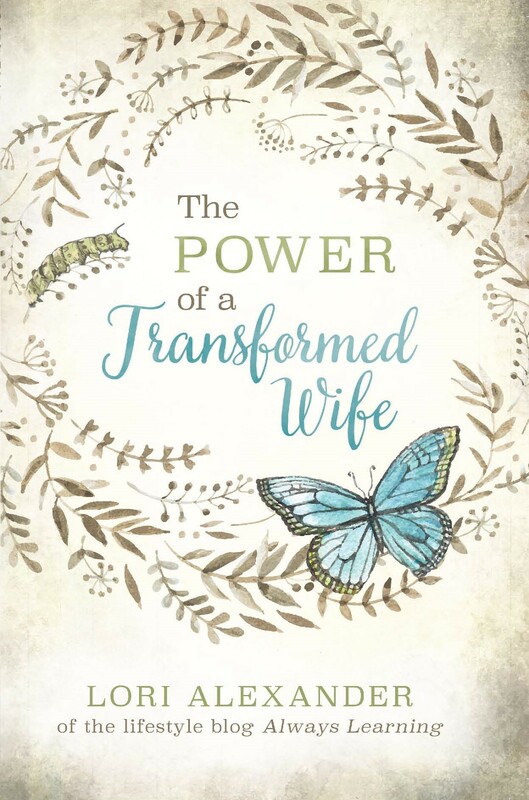 The domestic duties of the home are her sphere of Christian leadership, for she is to be a ‘keeper of the home.’ Her first ministry is to her husband and children as she loves and serves them as a Christian wife and mother. This is WHO the Christian woman ought to be! Thanks for the link to Robert Truelove’s blog post, Lori. I left a supportive comment there referencing the Bible’s plain teaching on the role and place of women. It’s not going to change. Oh, that we women would be content and find rest and peace in what God has commanded of us! It goes well with us when we do. Amen! Yes, Lady Virtue, I hope he keeps on writing since it’s rare to find a man that isn’t afraid to speak the truth. I enjoyed reading how he responded to some of the women in the comment section. It’s amazing how readily and easily women are combative with men these days and incredibly sad. I believe there is a spirit of the age right now that has a particular hatred towards men. And also towards the word of God concerning the role of men and women. I was saddened to read the post, as I do agree only men should teach seminary. As for myself I want to guard my heart against being bitter towards men, and following the masses in this regard, as I want to stay pleasing to my Lord and my husband. Blessings Lori. This is the enemy’s goal, Robin. He wants to pit men against women, blacks against whites, poor against rich which all cause division and upheaval. We all must guard against this and appreciate and value the differences in each other; for we are called to love others not compete and compare. I saw that post yesterday on your Instagram, and it really made me think. I grew up church of Christ and went to a COC affiliated college where just at least half of the male population was a youth and family or preaching major. And, now that I think about it, there was not one woman in a teaching position in the Bible department, and I wouldn’t have it any other way. The Bible classes that I took were some of my favorite classes and some of my most memorable professors! That’s just the way it should be, Angela! When I attended Westmont College many years ago, there were no female Bible teachers and I don’t remember there ever being female Bible teachers at the Christian high school my children attended which looking back, I very much appreciate. We did have a woman say a prayer in Chapel once. She was probably recruiting volunteers for something. Now, I think it’s kind of funny, as she wasn’t associated with LCU and probably had no idea that what she was doing was not considered appropriate. There was a collective gasp and quite a few eyebrow raises. I don’t think she was asked to return. Sadly, David Lipscomb University has hired its first female “theology” teacher. It’s the beginning of the end for that once fine and biblical institution. Honest question, where do you see single women in all of this? Not as far as Seminary, but a single woman does not necessarily have a home to keep or a husband to teach her. The Bible states that single women are to be holy in body and in spirit. If they would love to marry and have children someday, they need to make sure that they don’t find themselves in a position with a lot of debt and a career that would be difficult to get out of if they were blessed with children. A couple of thoughts here, if a married couple desire to go to seminary in order to serve on the mission field, I don’t necessarily have a problem with the wife attending classes. Secondly, I tend to agree with Michael Pearl on the idea that seminary/bible college is pointless. Learn how to study the bible correctly and you end up learning more than you learned at seminary/bible college! My husband has learned so much more than when he went to bible college. One of the downfalls of going there is that they openly mocked people who used the King James version. They favoured the NIV 😝 so now he doesn’t agree with the idea of such institutions at all. Many of the seminaries have, unfortunately, gone liberal in their interpretation of the Word and yes, what’s wrong with deeply studying the Word for themselves and becoming teachers of the word? There’s nothing in the Bible that says that pastors need to go to seminary to be a pastor. Definitely confusing to have women teaching men to be Bible teachers if women are kept from that position themselves. What Robert True love wrote is great. The name of the article could easily be misunderstood though… as women being worthless. But I realize he meant that that kind of women’s ministry is not correct and is worthless. I listened and read what he had to say about the title of his article and he said that women who are not fulfilling their God-given command but are instead seeking fulfillment away from it such as in women’s ministries are worthless. We are to obey what the Lord has commanded us to do; for if we love Him, we will obey Him. Jesus didn’t love me because I was worthy. He loved me IN SPITE OF ME! I myself am absolutely “worthless” and let me be the first to say that I struggle with being “worthless” EVERY…SINGLE…DAY. Before God, every ounce of worth I have is to be found in Christ. Go ahead and tell me how “worthless” I am…I would just nod and agree with you and ask you to pray God grant me grace to glorify Him. What about women who want to serve as missionaries? Especially those who want to remain single? Can they attend seminary? And those who want to serve others through counseling ministry? Do you see a place for women to help women in counseling ministry?